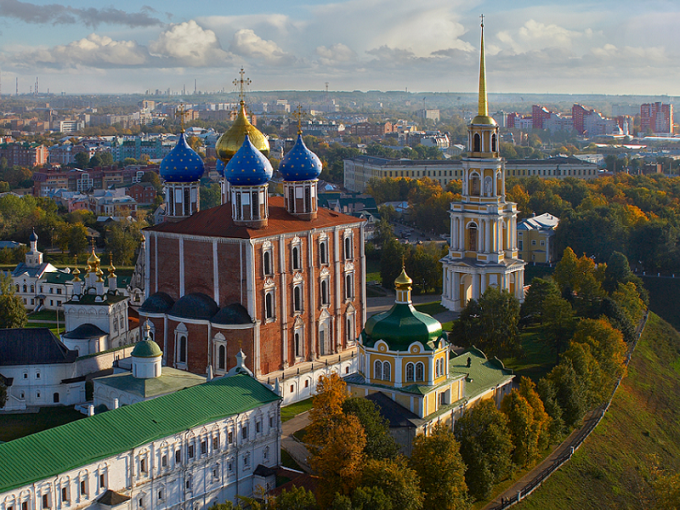 Ryazan is located 180 km South-East of Moscow. You can get there by car and by all public transport, except, perhaps, of the aircraft. Each method has its pros and cons. Embark on a journey by train. It's not the most comfortable and the fastest way to get to Ryazan, but it does have some advantages. First, travel by train to Ryazan cheap in comparison with other modes of transport, and, secondly, the trains run strictly on schedule. They are sent from the platform of the Kazan station at the metro station Komsomolskaya. Journey time is three and a half to four hours. When planning a route, remember that a part of the summer trains in the winter time is canceled, there are also small breaks in the schedule in the middle of the day. Take a trip on the Express train – a train that makes one stop in golutvino. Journey time is just over two and a half hours, though the fare is slightly higher in comparison with conventional train. In addition, you can choose the class of service, in the first TVs, and the chairs are comfortable. Daily performed three times – morning, afternoon and evening. Purchase the train ticket of distant following. Through Ryazan trains to Kazan, Chelyabinsk, Samara, Ufa, Voronezh, performing flights to the South. The cost of one second-class seat is about two times higher than the price of a ticket on the train. Please note that some trains in the direction of Ryazan departs not only from the Kazan station, but also from the Kursk. The schedule of departure of trains and Express trains to Ryazan can be found on the official website of JSC "Russian Railways". Plan your trip to the intercity bus. Quite comfortable vehicles leave from the bus station near the metro station Vykhino every hour. Also, several flights per day is from the bus station at Schelkovskaya street and the Ryazan lane. Buses arrive at the Central bus station of Ryazan. To see the schedule on the websites of the carriers. If you want to drive to Ryazan by car, ask if there are any traffic jams now. Departure from Moscow it is better to carry out with the Volgograd and Ryazan highway depending on the load track in the area of Tomilino, the two roads converge in the Novoryazanskoe highway. To save time it makes sense to travel on the ring road Bronnitsy and Kolomna, the way you get a little longer, but do not have to stand at traffic lights. One of the advantages of traveling by car in the spring is the opportunity to stay in the suburbs of Ryazan and see the famous water meadows. In the city of Novoryazankoe becomes Moscow highway, which in turn is converted to the first Avenue leading to the historical centre of the city.